Today saw an attack on an Israeli military convoy in the Shebaa Farms area on the border with Lebanon. Below are sample reactions from Hezbollah and allied social media. 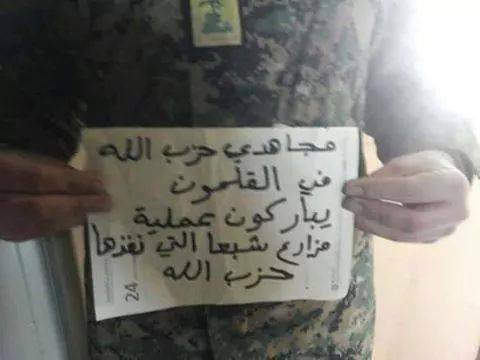 "Mujahideen of Hezbollah in Qalamoun [Syria, on border with Arsal in Lebanon] bless the Shebaa Farms operation that Hezbollah executed." "At 11:25 a.m. today, the group 'Pious Martyrs of Quneitra' [referring to the Israeli strike on Quneitra that killed high-profile members of Hezbollah] in the Islamic Resistance targeted an Israeli military convoy in the occupied Lebanese Shebaa Farms- composed of a number of vehicles and including Zionist military officers and soldiers- with appropriate missile weapons, leading to the killing of a number of them and wounding of a number in the ranks of the enemy. There is is no victory except at the hands of God, the Great, the Almighty. #TheIslamicResistance #TheArabNationalistGuard." This statement has also been featured on social media for other Shi'a Iranian proxy militias besides Hezbollah, such as Iraq's Kata'ib Hezbollah.